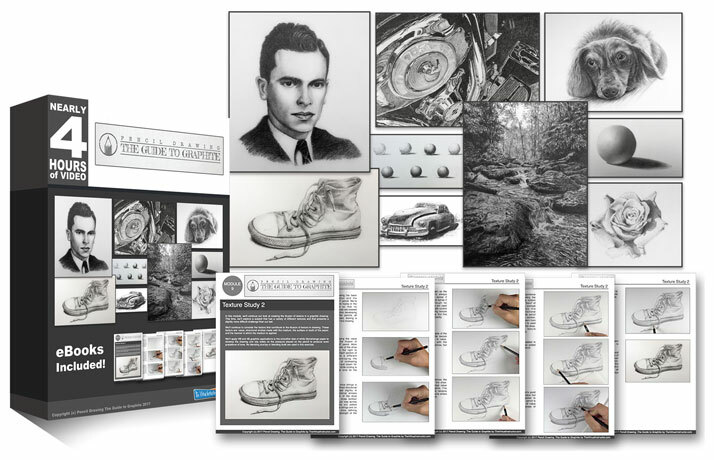 Description: A look at sketching with graphite. Sketching as a study, for form, and as a preliminary drawing is explored. Suggested Materials: White drawing paper and a 2B graphite pencil. Hey Matt,I just thought I would check out the new course even though I started portrait drawing. I might actually dip in and of this for now and I went straight to this one because as you know I’ve struggled with sketching as in I can’t help but make it in more detail as if I was doing a finished drawing, in your blog I noticed that other beginner artists have the same issues so glad it wasn’t just me. Oh also, I hope that maybe next or later you will do a charcoal course like this one. I’m yet to start a proper charcoal drawing !! I got a Strathmore charcoal pad which I’ve not used yet. I think for now I’ll look at your live lessons. I think you did a charcoal boots one so one night a couple of weeks ago, my daughter too her boots off and they looked great the way they just sat there, I photographed them and this will be my 1st charcoal drawing with a photo of mine. I hope the boots are still there. Also now I’ve mentioned I hope it’s still there, so do you eventually delete them at some point. I’m sure i remember some and now they not there. If you do delete at some point, would you consider putting some sort of like how long it will be available for. So we can prioritise more. No videos are deleted. All of the videos and lessons ever made are still available on the site. Awwwww that’s brilliant Matt, I thought you didn’t delete them I wasn’t sure. Iam glad you included this module on sketching. I needed to understand better the difference between sketching and more refined work. And I am going to commit to sketching each day. I too would like to have a complete course in charcoal. I am particularly interested in charcoal portraits, using white charcoal also to push the values both ways. On toned paper. Because I really enjoy looking at drawings done this way and doing them. I already do some graphite portraits using white charcoal for highlights on toned paper. Love the effects. Me too, they look great in toned paper especially Gray toned. That 1st photo reference is gorgeous, I love that building, I guess it was taking where you from. I took both the Secrets To Drawing Course and Portrait Drawing The Smart Way. I was almost not going to take this course thinking it was just a review of things I already learned in the other two courses. Boy was I wrong!… And I am only finishing up this 7th module with many more to go until I complete this course! I am enjoying this course immensely and still learning new things.😄 Both Sketching and gesture drawing is hard for me too and am always embarrassed when someone wants to peek in my sketch books. Lately I have been trying Urban Sketching that captures “the moment or event”, but my sketches are just not that good. But I have decided to keep plugging away at it as you never know, I might just get one right someday! In the meantime, these courses are wonderful, providing some much needed instruction and skills. I,m so glad to have found this site and I love this video on sketching. I always find myself and have been told by art teachers that when I do a sketch I am trying to put too much detail in it and I treat it as a finished drawing. I have such a hard time just sketching for studies etc etc because I am a perfectionist. Are there other tips I could use to stop drawing to do so much detail and just sketch?? I am going to practice this lesson every day for at least an hour to try and get better. Thank you matt for this amazing site. hi..matt..loving the courses. I have done 25 days to better drawing..now started on graphite. I would love to practice sketching and learning how to shade or cross hatch and add form..what should i do next? You can practice with any object you wish. It can be as simple as finding objects on your desk or around your living space.